(to avoid scrolling through the entire page). Please let me know what you have to sell today - please provide a full description including the price required! Transfer guaranteed (must be taxed & Mot'd ) to UK bike or car or full money back. 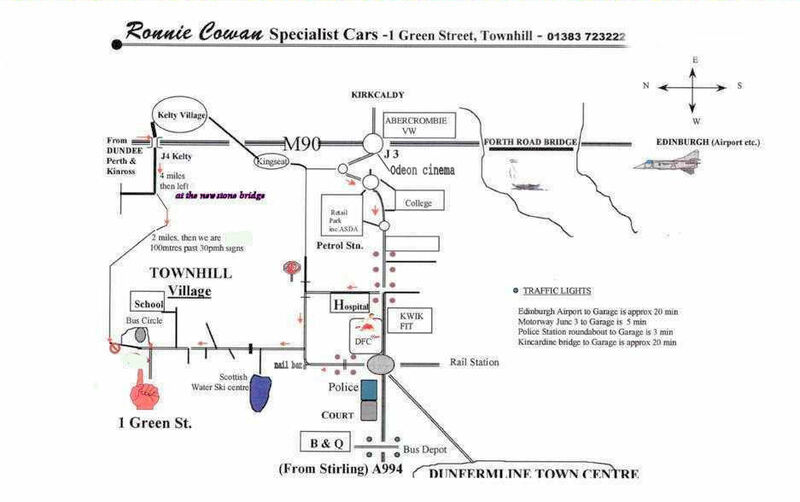 How to find Us (map)?? 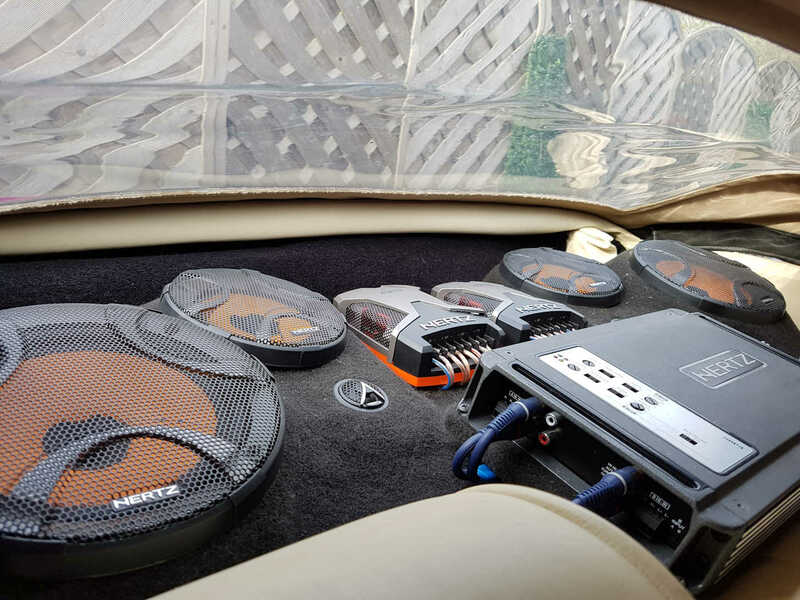 "This car sounds awesome & drives like only an AMG Tuned Merc can !" 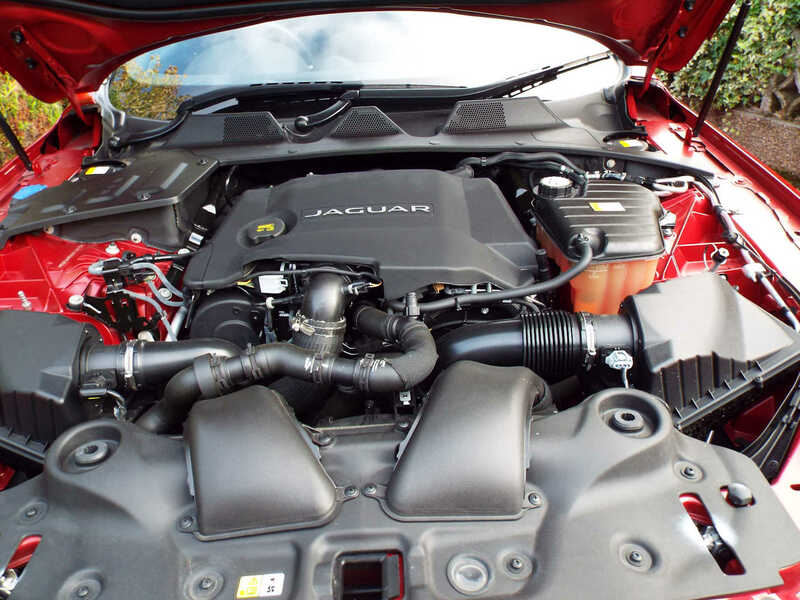 Customer's are always advised to also check that they are accepting of any manufacturer or road test performance figures or specifications independantly before proceeding to purchase. We accept no responsibility for the accuracy of any claims made by vehicle manufacturers or their appointed agents and only pass on this information in good faith and without prejudice. Vehicles must be paid for after inspection and before collection in person or by buyer's authorised agent. The Above vehicle is here on site, owned outright by us, HPI cleared, fully prepared and ready for immediate collection subject to cleared funds. Part exchanges :- we can accept most vehicles in Px & these will be fairly priced based upon condition after viewing (reflecting any refurbishment required) . To assist with your decision:- we will always provide you with accurate information & a service second to none from the outset. 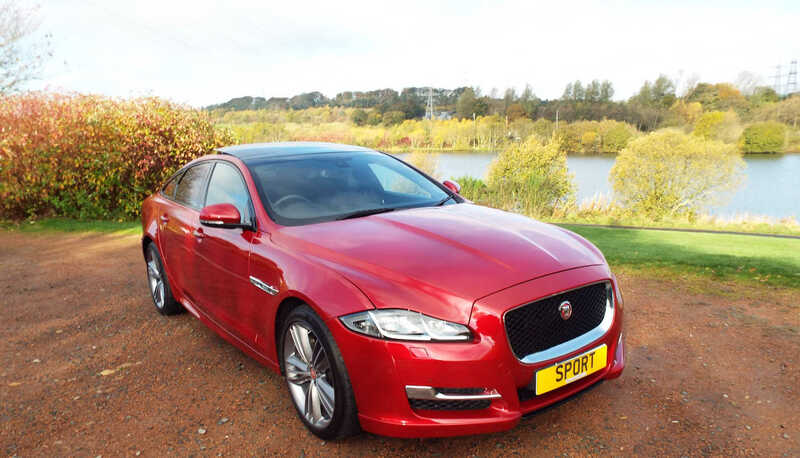 Sales:- enthusiastic and eager to ensure that you are matched with a vehicle that suits your needs at a mutually agreeable handover price in a very relaxed, honest & informal manner ! Personal callers:- are welcome and we will be happy to arrange a mutually convenient time to view & discuss any preliminary aspects of a potential transaction. NB where vehicles cannot be expected to be returned eg due to distance, RCSC can arrange with a locally appointed repairer subject to definitive proof of failure and cause (before repair authorisation is given). Payment:- Payment:- we can accept a non refundable holding payment in order to remove the vehicle from sale (whilst you arrange your funding) an independant finance broker will seek the best terms for your situation if required. by credit, debit card, PayPal, Bank Transfer or Cash - The balance must then be paid in full upon collection by Debit Card, Bank Transfer, Certified cheque, Cash or your chosen Finance company cleared funds. We purchased this car in 1998 when we became the sole Scottish service/sales dealer for this highly regarded Wiltshire based Marque. 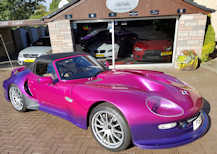 Marcos had been producing bespoke low volume quality Sportscars in England since the 50's with a fantastic race track record (Lotus /TVR/ Morgan era). 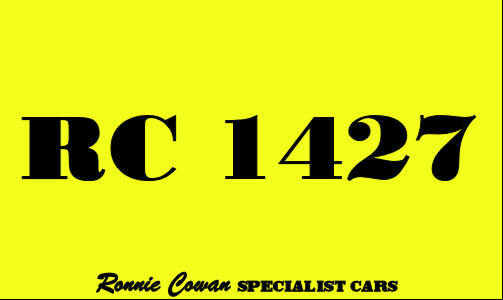 Their historical range of cars still have an enthusiastic following and importantly spare parts are still available. TV motoring presenter and race driver Vicky Butler-Henderson's brother Charlie was the popular and successful race driver for Marcos. 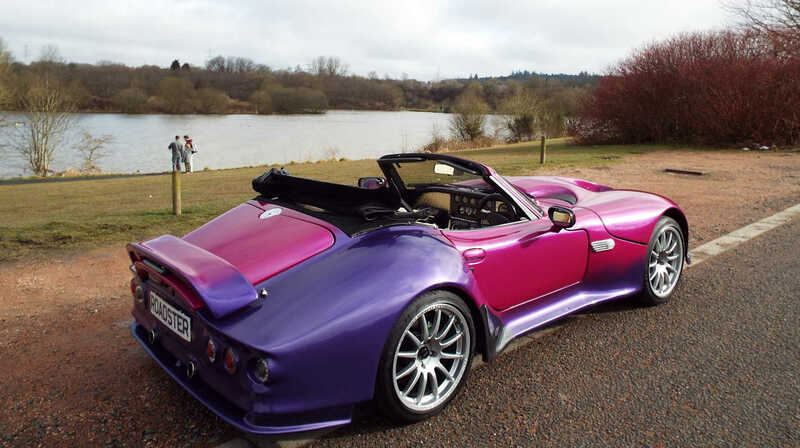 Always heralded as reliable and futuristic the fibre glass bodied Mantis was developed using the expensive but brilliant Ford Cobra small block 4.6 engine (352 Bhp). Price @ £46,883 for a basic example + orc (these were totally bespoke built). is beyond comprehension ...... delivering 0-60 in 4.3 secs, 0 -100mph in 9.6 sec and a top speed of 170 mph!" .... unlike their competitors who at times designed and made their own often with catastrophic inherrent faults ! The Marcos factory was a sight to behold as skilled craftsmen worked in very old airy buildings yet turned out some amazing workmanship. They painted in the equivalent of a rickety home garage yet their paint finish was pretty flawless (in any colour you chose) ! (the founder's son & ex Le Man 24hrs race driver) was driven by enthusiasm and not numbers. 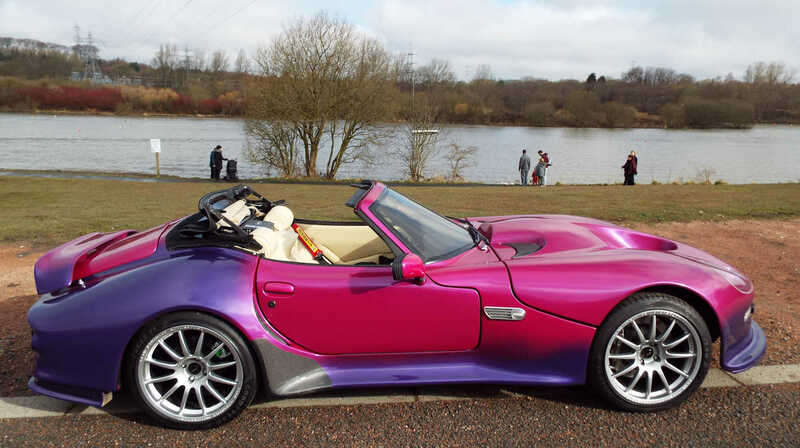 the new Mantaray model was launched at the 1999 Earls Court Motor Show - this model never really captured the outrageous lines or drive of the LM or Mantis. after a deal with a Dutch buyer that quickly proved most unfortunate for the Wiltshire based factory. 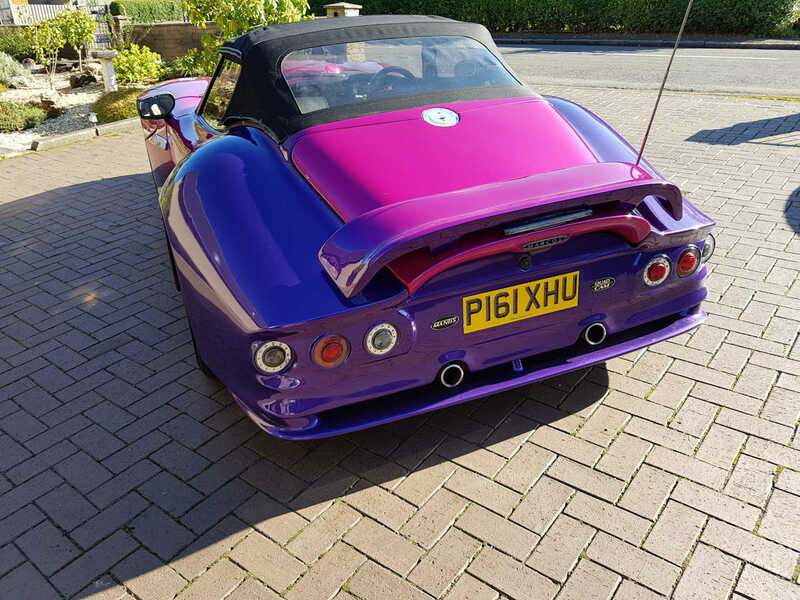 I purchased and fitted some of these to our own Mantis eg , rear boot spolier, reat under spoiler, spun alloy gear knob and handbrake lever etc. 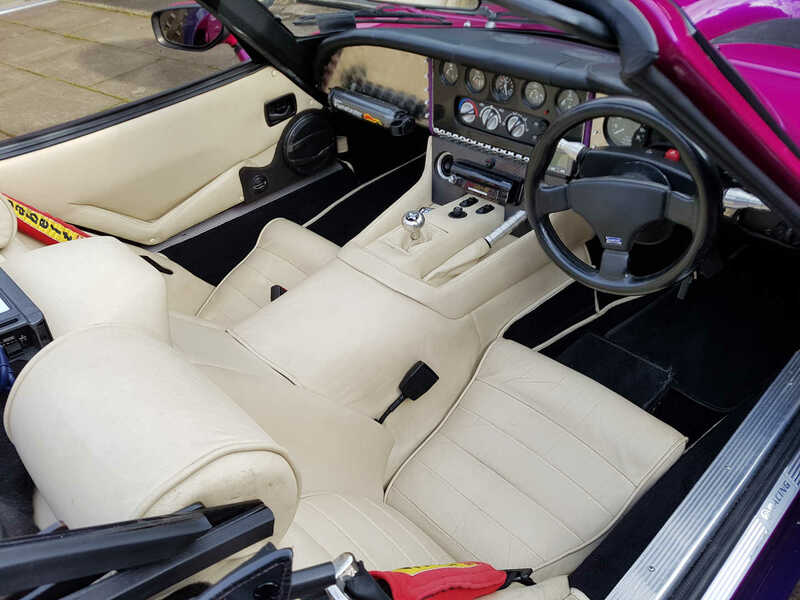 the interior was completely retrimmed using new cream Scottish leather courtesey of Andrew Muirhead (Glasgow based). 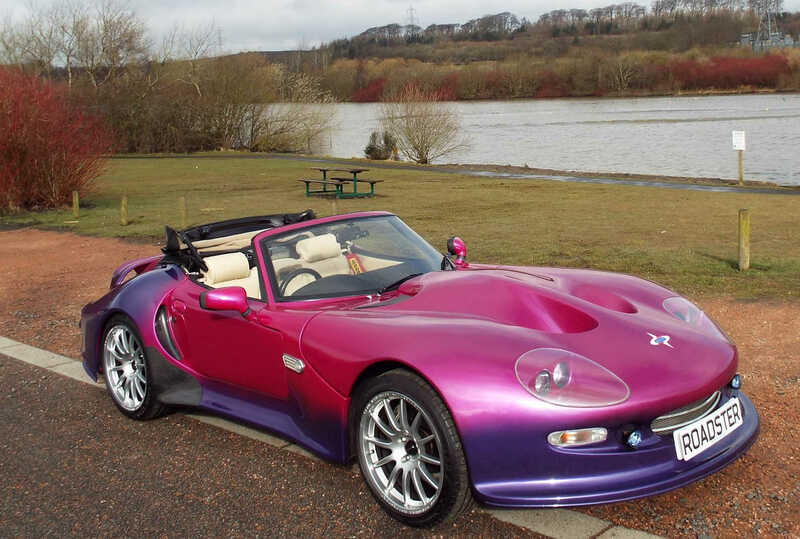 the lower area of the body was painted in deep purple to complement the original factory finish. We had the car decalled for show purposes but these have long since been removed. All of the suspension rubber joints were replaced with nylon bush race types in order to firm up the handling. 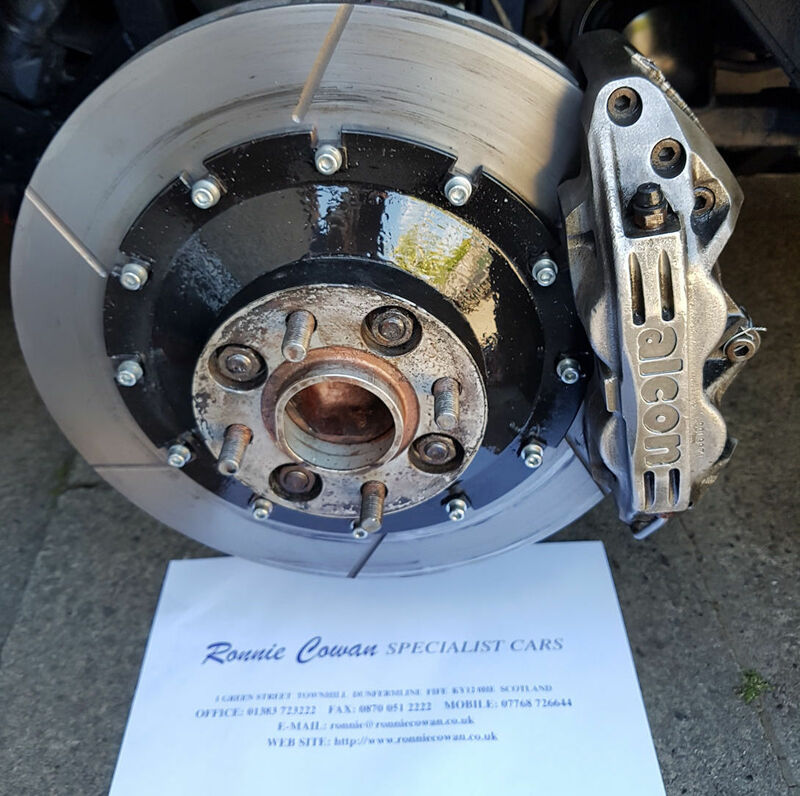 This car benefited from large 350mm dia floating Alcon race brake discs and alloy calipers on the front (expensive option fitted for the Motor Show ). 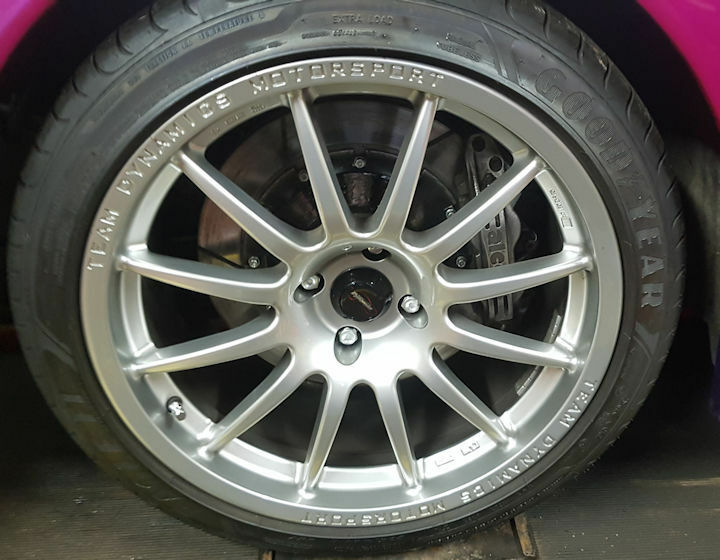 We have just replaced both front vented brake disc rotors 5/7/18 (same size but a more modern version & larger than a Nissan GTR rotor). 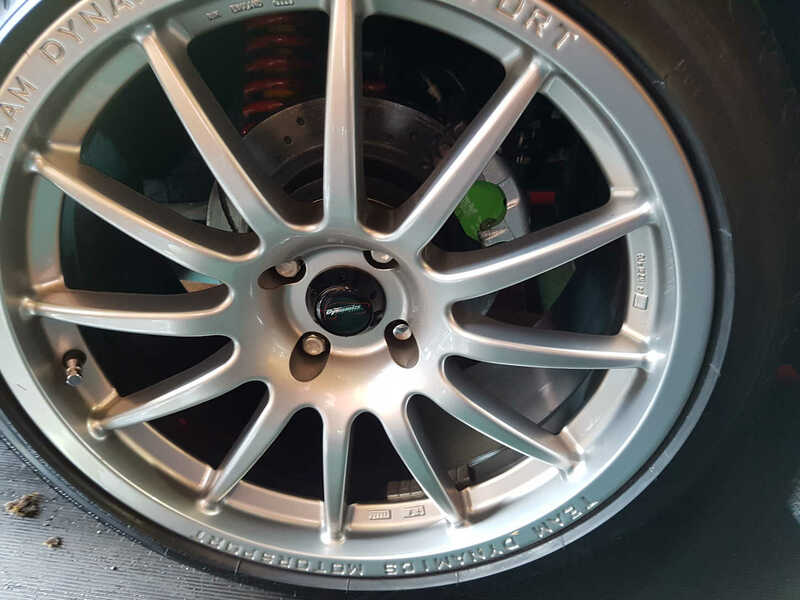 NB Floating rotors do not move as the term suggests but are less likely to warp than solid discs due to better ventilation and expansion tolerances also are less heavy but pretty expensive ! A new heavy duty battery and better boot lid struts were also fitted. 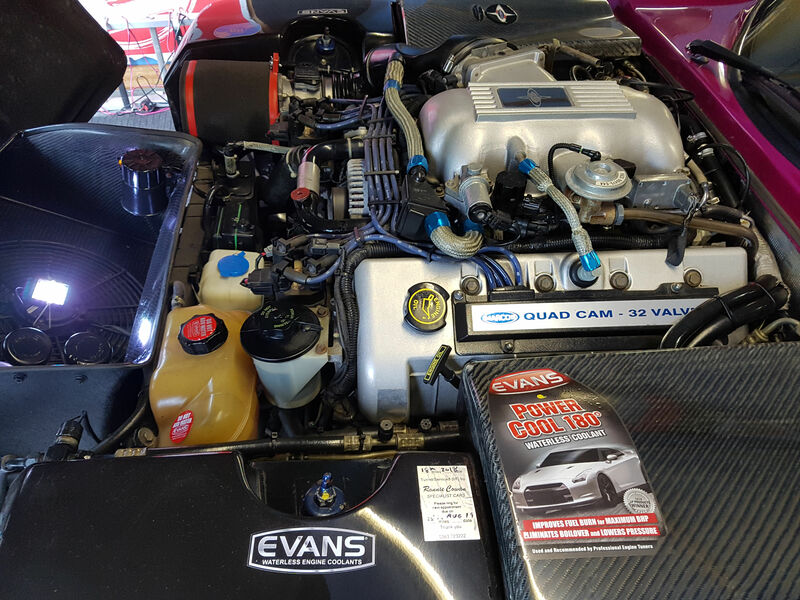 July 2018 converted to 'Evans Coolant' - water and anti freeze free, non corrosive, low operating temperature coolant system alternative. 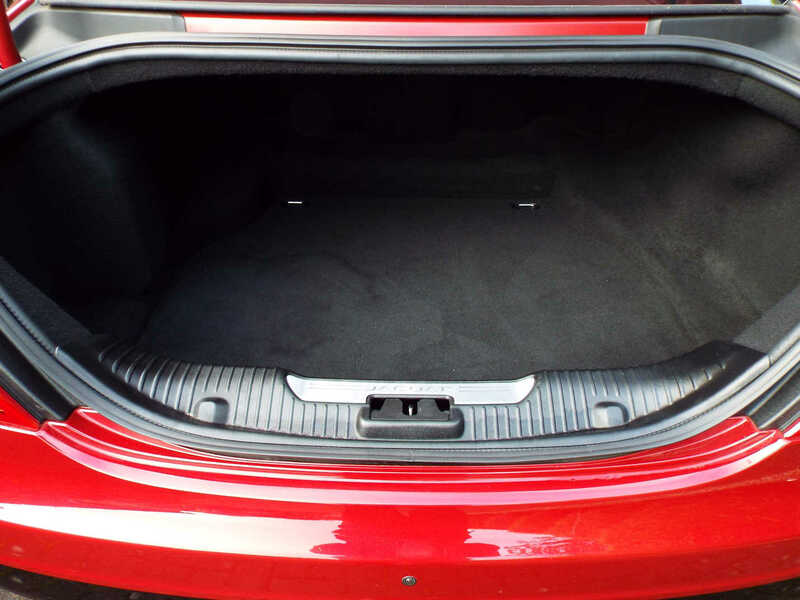 The heater & Air conditioning works great and this car also features a heated windscreen. It already had a removable race type steering wheel which can be removed to ease access (if racing )! 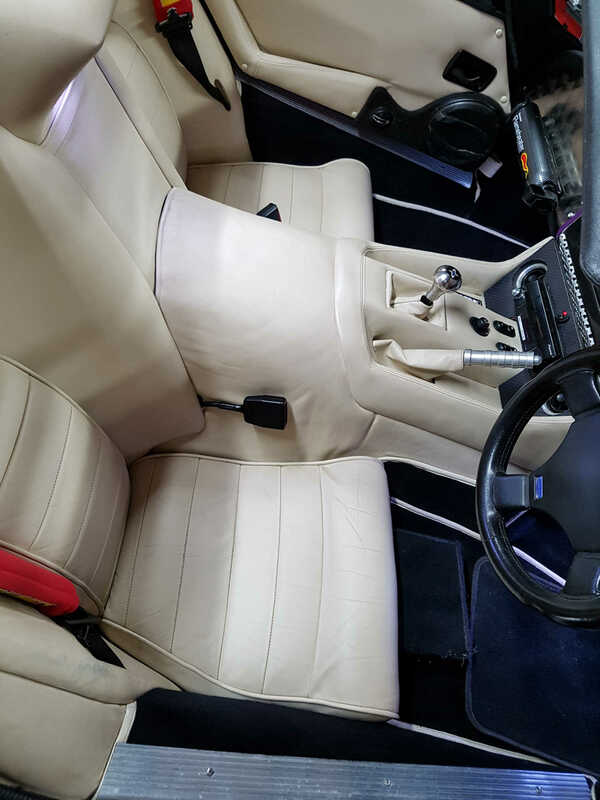 The seats do not adjust but the driver's pedals move electrically (Marcos took this idea from the world of aviation). I had the idea to fit a Grill mesh behind each of the air intakes - which was later copied on the factory built GT series. 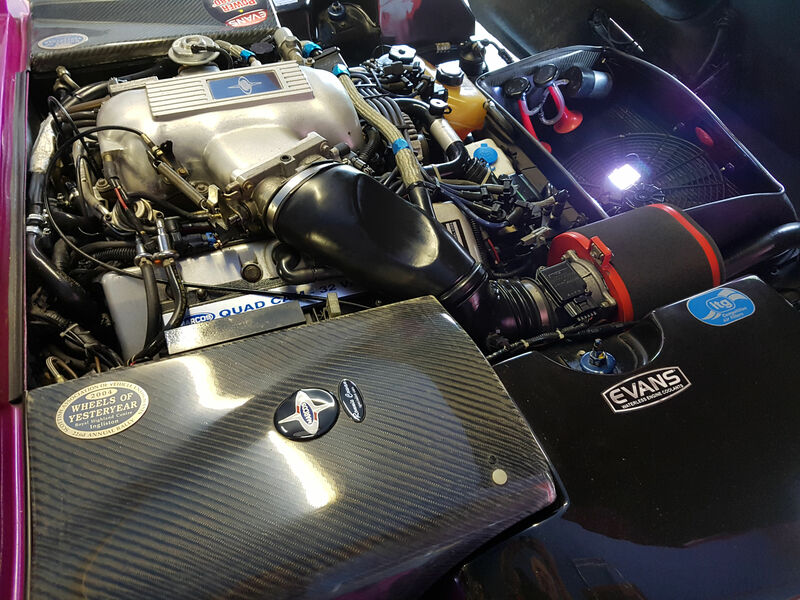 A full dual stainless steel exhaust system was fitted (no cat) which allows this mighty V8 to roar ! 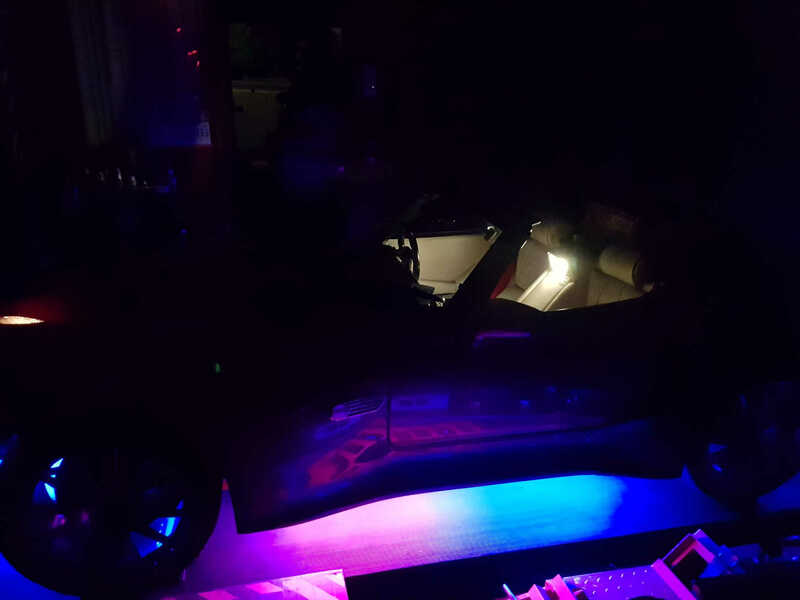 with all of the interior lighting & under car tubes featuring sequencing coloured leds for show use only. A talking Thatcham alarm system was added to better protect this unique vehicle at the various car shows we covered - it requests people to stand back if they get too close. 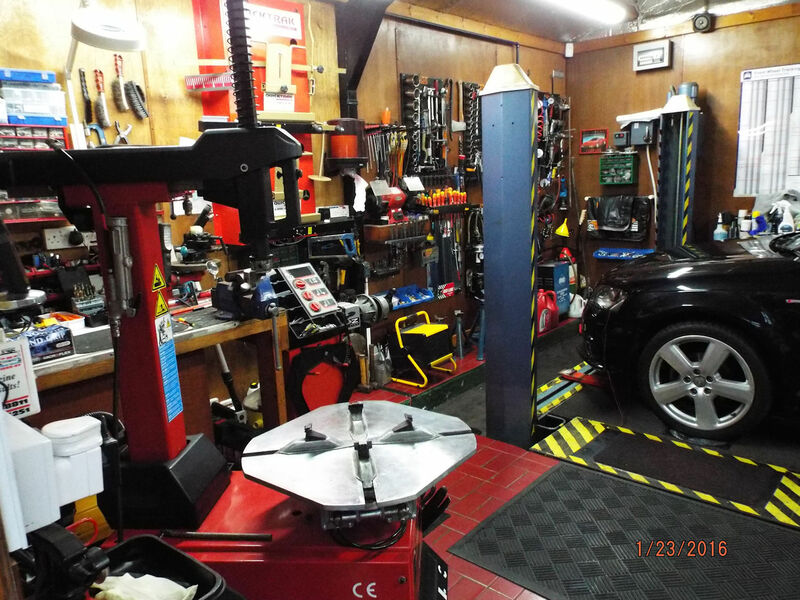 Our customer religously had the car collected annually by trailer in order that we could service it here & MOT it (regardless of the negligible mileage he covered yearly). 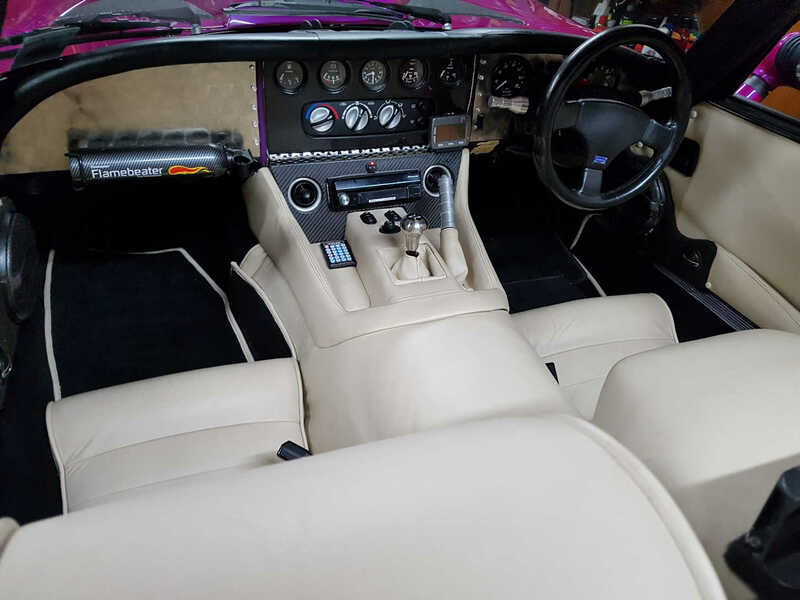 This car is a 'one off' and is in exceptional condition in every respect - It is outrageous, loud, radical, reliable and turns heads everywhere it goes ! Payment:- we can accept a non refundable holding payment in order to remove the vehicle from sale (whilst you arrange your funding) an independant finance broker will seek the best terms for your situation if required. 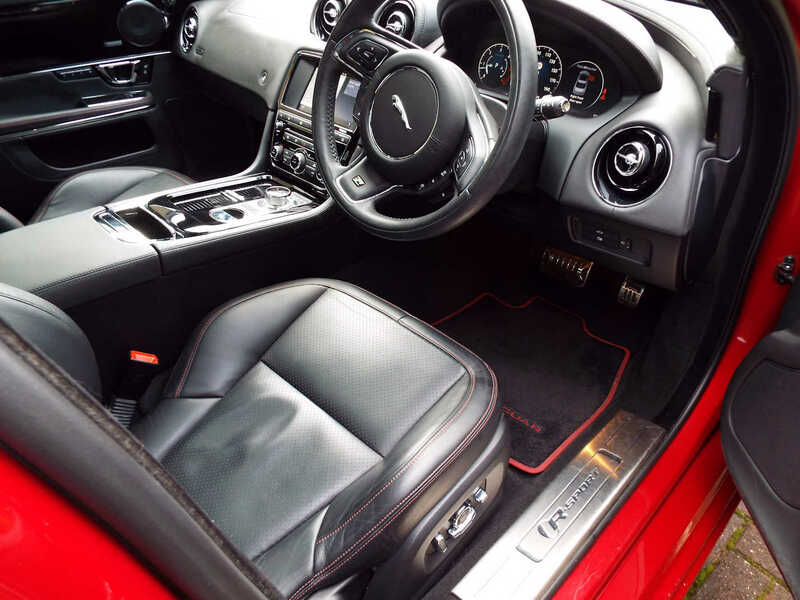 "Still one of my favourite cars in terms exceptional sporty looks & value"
JCW highlights include :- Sat Nav, Bluetooth,Cruise control, Air Con, a multi-function steering wheel with shift paddles (in conjunction with Steptronic transmission), stainless steel pedals and footrest, Driving Excitement package and key. The aerodynamic changes have been designed with a purpose rather than for purely aesthetic reasons. A new front apron with large engine air intakes, distinctive side sills, a model-specific rear apron and a John Cooper Works spoiler. 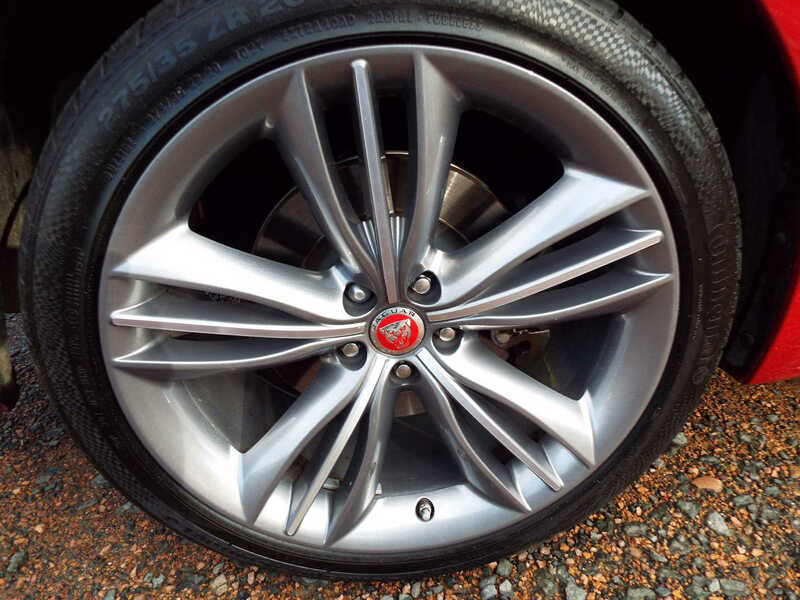 2015 onwards cars feature the newly developed four-piston Brembo brakes . 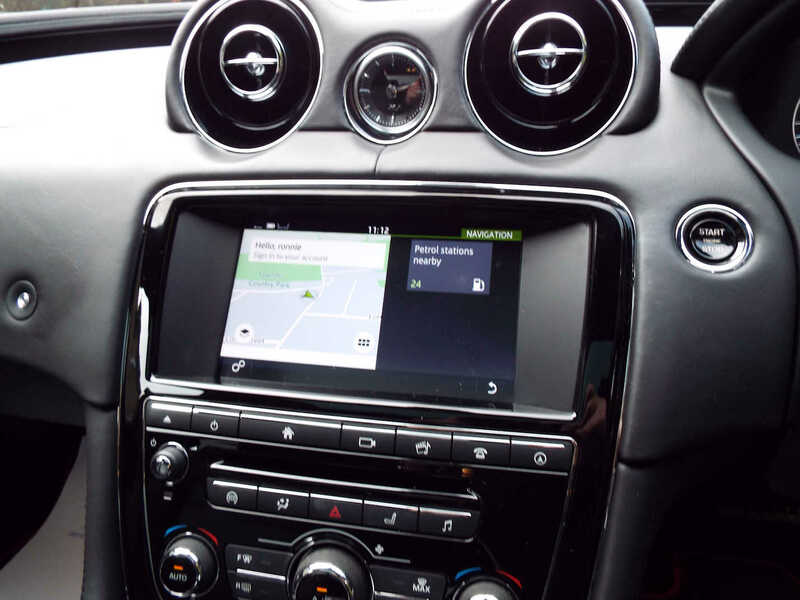 Bespoke JCW personalisation options includes a model-specific MINI Head-Up display (with rev lights and gear indicator). 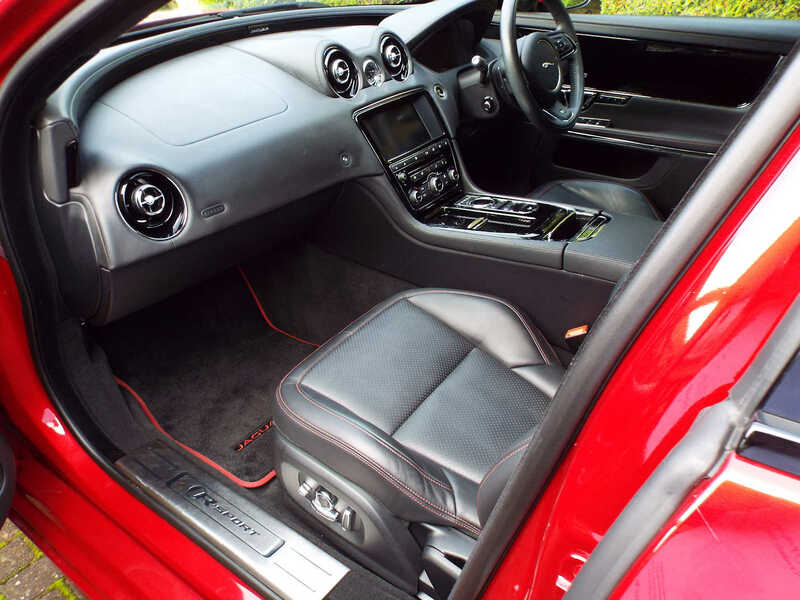 This car is gleaming Chili bright red with the black roof and door mirror covers option with bonnet stripes and exterior and interior John Cooper Works Pro design accessories. 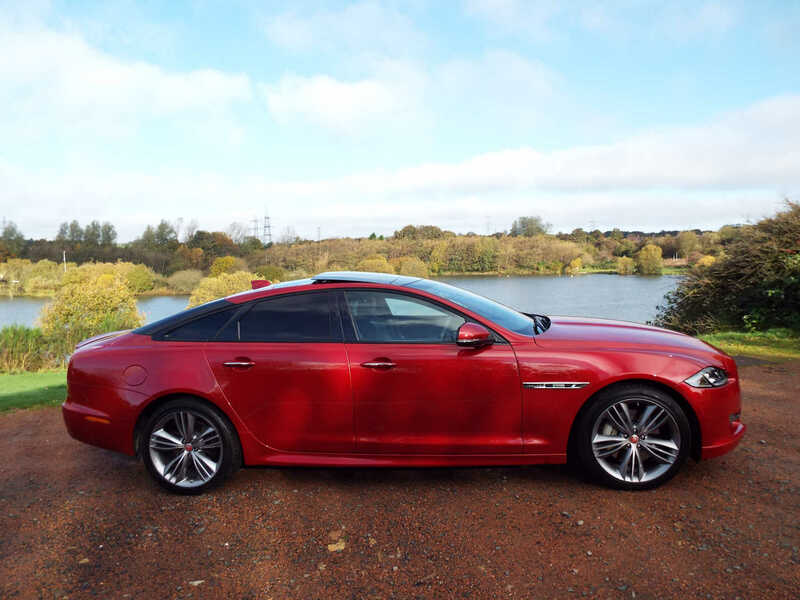 top speed 152mph; 49.5mpg combined (auto); 42.2mpg combineds (manual); 133g/km CO2 (auto); 155g/km CO2 (manual). 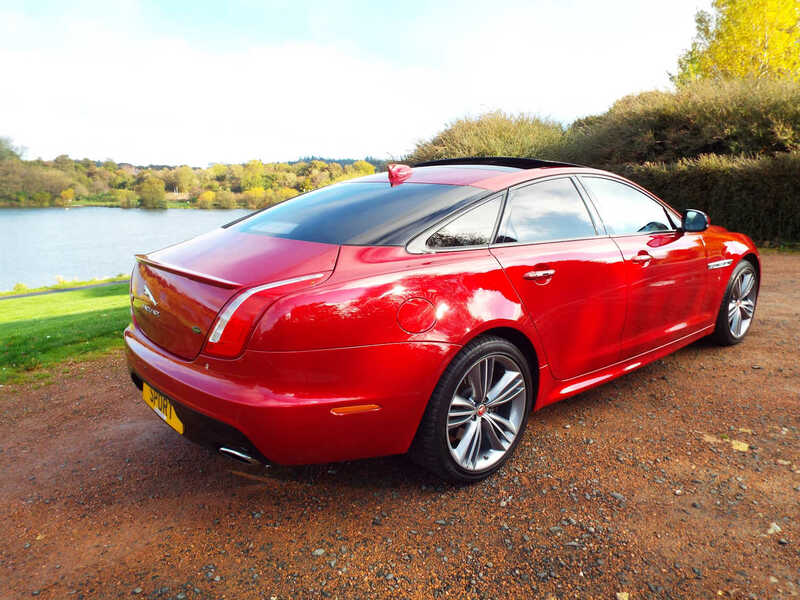 "A lovely example of this pretty scarce 1 owner diesel Supercat"
"A stunningexample of this practical 1 owner lovely spec diesel estate car"
"A two lady owner car, best honestly described as like a 1year old car in pristine condition"
5 door/ 7 seat luxury offering economy & 4WD ! 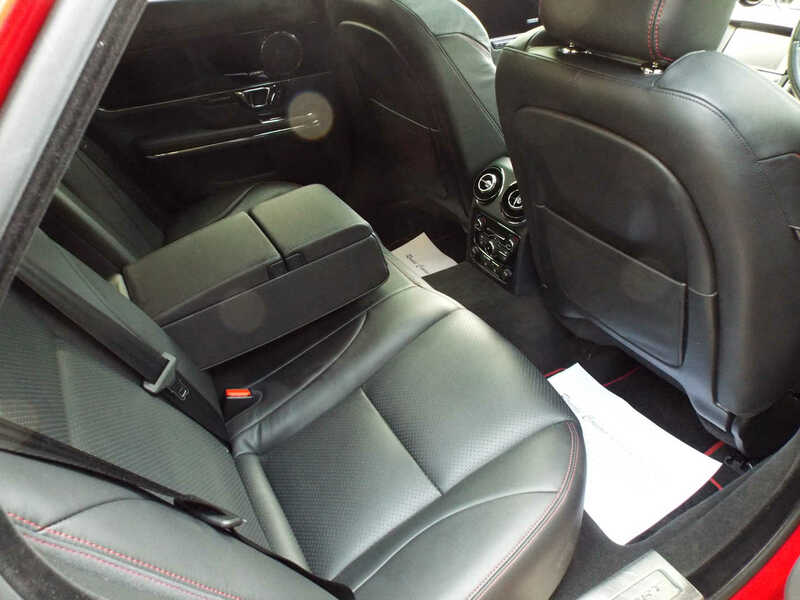 Audi Dealer Serviced --- V5 + 2 x Keys + Full Doc Pack all here. Offered for Sale on 20" Audi S Line 5 spoke Silver Alloy Wheels with New Vredestein tyres - " The Ultimate Q7 4x4 Tyre'"
This is an unusually versatile little automatic car in that it has the ultra useful rear truck pick up bed (with hydraulic tilt) ideal for moving garden waste etc in the summer, with the roof & doors removed it is a nice little 'open top' fun car, if you need to use off road it has four wheel drive & diff locks giving loads of grip and power, in the winter the snow plough can be attached quickly (10min - two quick release bolts & a hook), the electric winch connnects to the plough via a hook the height can then be raised or lowered from the comfort of the very adequate cab. 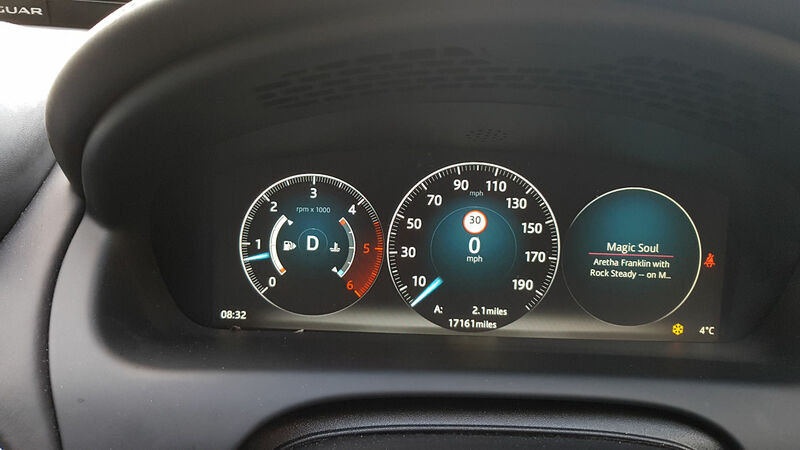 Illuminated Dashboard: use switch to turn lights on and off. 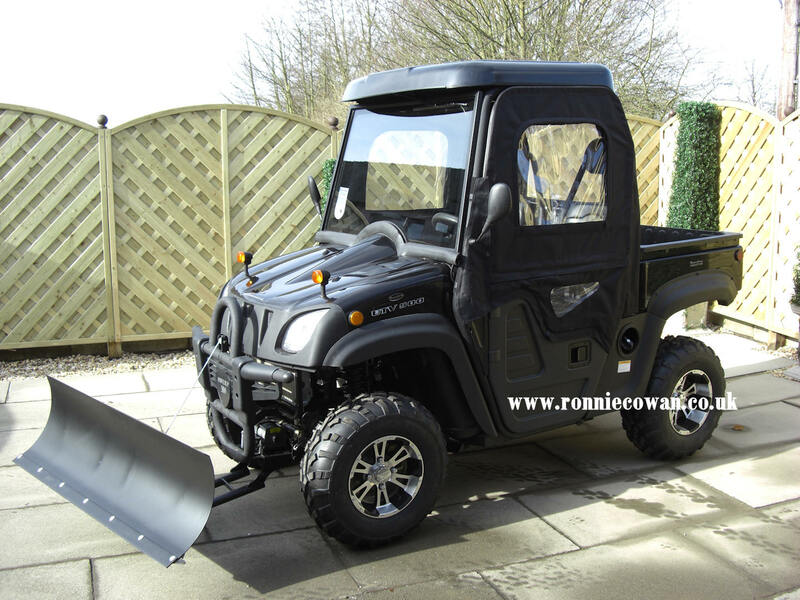 Compared to the 300cc models the 500cc 4x4 features a Larger Cab ( 6 more body and leg room for a more comfortable drive). Quad Rear Shocks: Each wheel has two shocks. Manual Choke: Located below the seat and between the drivers legs. 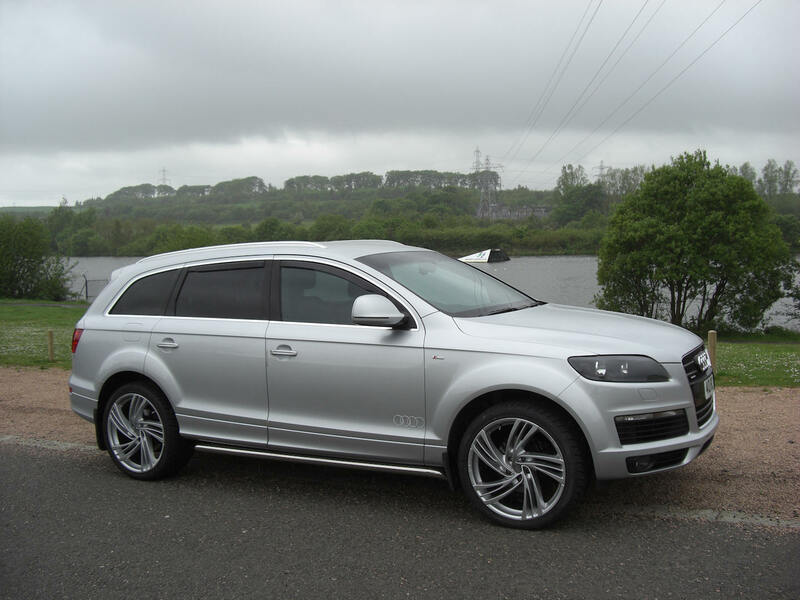 Great Value @ £6995 (inc Vat) -- PX car or superbike welcome - Cash either way ! Payment:- we can accept a non refundable holding payment in order to remove the vehicle from sale (whilst you arrange your funding) by credit, debit card, PayPal, Bank Transfer or Cash - The balance must then be paid in full upon collection by Debit Card, Bank Transfer, Certified cheque or Cash. Detail & pricing of goods/vehicles can vary without prior warning and any confirmation of information published on this Web site should be verified with our office before proceeding with any intended purchase.